A painting at Scolton Manor Museum was under investigation: similar paintings existed of Lieutenant General Sir Thomas Picton (1758–1815), at Carmarthenshire Museums Service Collection, and Sir Thomas Picton (engraved 1812), at the National Portrait Gallery. Scolton Manor Museum claimed to have little knowledge of their painting as it could be by or after Sir Martin Archer Shee, but they were uncertain. It may be a copy or the original of the full-length version held by Carmarthenshire County Concil. The frame’s brass plate simply says ‘General Sir Thomas Picton K.C., C.B., born at Poyston, 1758, M.P. for Pembrokeshire 1813-1815, fell at Waterloo 1815’. Oliver Perry traced the Carmarthen version as a present by Picton’s brother, in Leigh’s Guide to Wales & Monmouthshire for 1831. Tim Williams quoted another source, The history of Haverfordwest with that of some Pembrokeshire parishes, by John Brown (1914), which places the work as a copy of the Carmarthen picture. 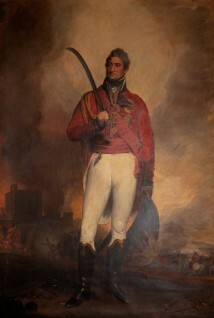 He added that Shee exhibited a portrait of ‘The late lieutenant general Sir T. Picton, KGCB’, at the RA in 1816. Barbara Bryant agreed with the results of research carried out by Perry and Williams, that the paintings are from Schee’s studio, and closed the discussion. The NPG indicated that they are happy to use the recommendation ‘studio copy after Shee’. The painting is now listed as by the studio of Martin Archer Shee (1769–1850), a copy of an earlier painting. Could this portrait be by or after Martin Archer Shee (1769–1850)?